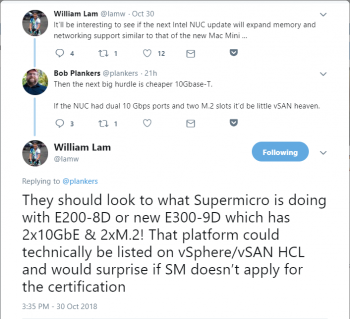 Fun discussion about Mac mini, Intel NUC, and tiny Supermicro 1U E200/E300 systems. I'm aware of the interest in these 2 newer SYS-E300-9D variants that quietly arrived without a press release. The product pages seem to first be noticed on October 30. The 8 core version is said to start shipping in mid-November of 2018. As with any new product, as a blogger, it's always fun to hear what others think. Please feel free to drop a comment below or tweet a reply. What are these 2 new systems all about, and how do they differ from the original SYS-E300-9D that arrived earlier this year. Let's roll up our sleeves and have a closer look at the specs. SuperServer SYS-E300-9D back, by Paul Braren at TinkerTry. Availability expected in mid-November 2018. 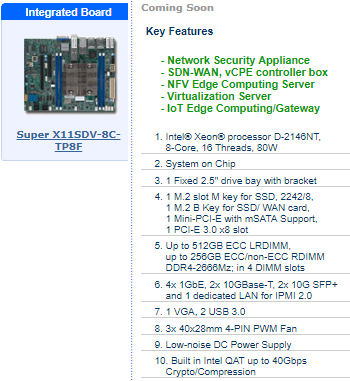 On Nov 13 2018, spotted X11SDV-8C-TP8F "Motherboard Manual" at supermicro.com/products/motherboard/Xeon/D/X11SDV-8C-TP8F.cfm, direct link here. 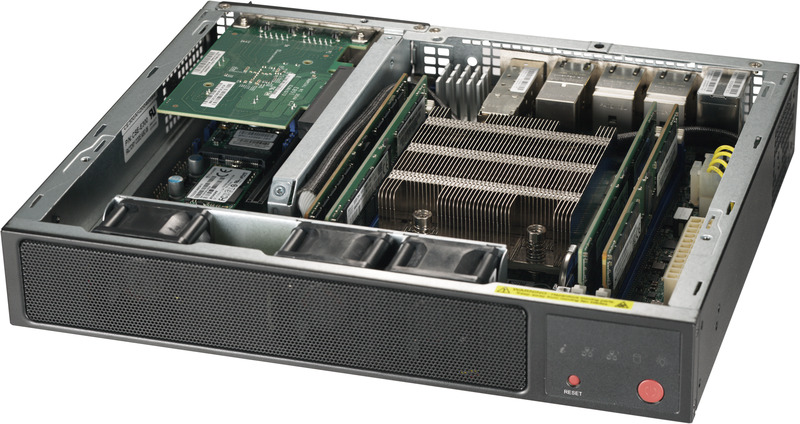 only one of the 2 PCIe slots can be used for expansion within the constraints of the SuperChassis E300. Getting to 512GB is currently pricey proposition, an industry-wide issue that affects all OEMs. When shopping around for the cost of 8 Supermicro-tested 64GB modules, it's currently $669.9 per DDR4 LRDIMM-2666 module on Amazon, totaling a whopping $5,359.92 for 512GB of RAM, on top of the price of the system. The two OCuLink ports are intriguing, allowing the CBL-SAST-0956 U.2 OCuLink cable to attach to two U.2 NVMe drives, such as the Intel Optane SSD DC P4800X Series. 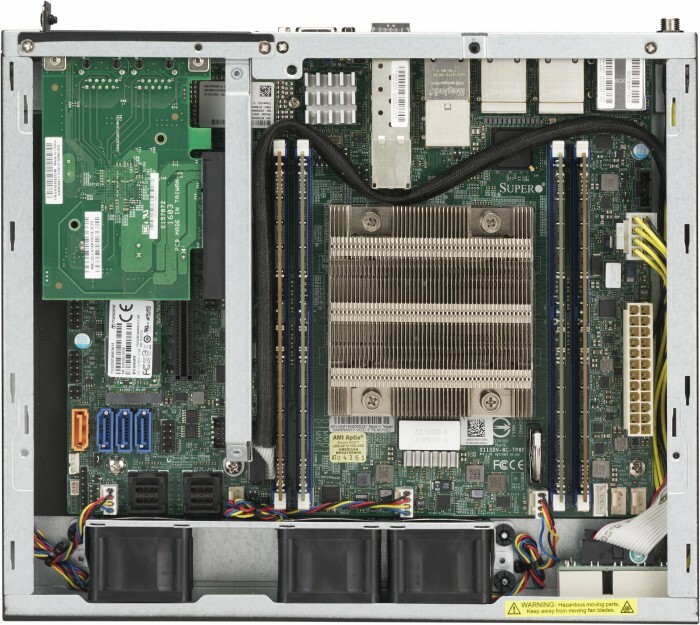 But based on my prior experience with the original E300-9D, I believe the only place such a tall (15mm) 2.5" drive would fit in this system is resting under the optional PCIe card slot, with no drive-mount holes there. If there's no optional PCIe card present, you can use the under-lid mounting holes. I'm hoping to get my hands on a loaner E300-9D-8CN8TP for hands-on testing, currently not optimistic that will happen. Shop for B07CZF7WGQ on Amazon. There are many ways to add additional M.2, but the tight constraints of this chassis will only allow one of these to physically fit, such as this single M.2 card that David Chung spotted on Amazon, which I'm currently testing. This is good! 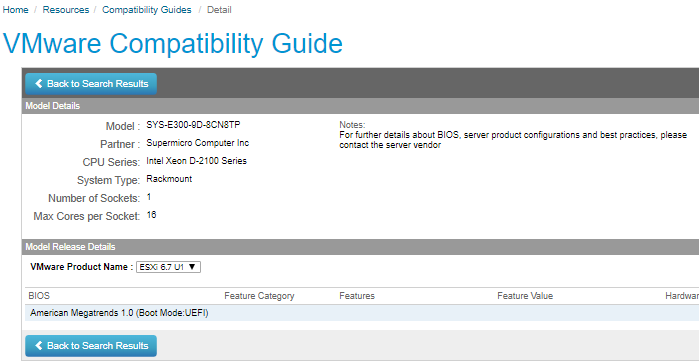 Currently, the 8 core SYS-E300-9D-8CN8TP is apparently one of only 3 Supermicro Xeon D-2100 based systems on the VMware Compatibility Guide, seen listed for ESXi 6.7 Update 1 here. Having 4x 1GbE, 2x 10GBase-T, and 2x 10G SFP+ should be versatile enough for even the toughest network use cases and/or vSAN! Given how difficult it is to quiet any 40mm/1U design down, I'm more keenly aware than ever that Supermicro's reluctance to innovate in the area of chassis design is hampering their Xeon D product line. A Flex-ATX motherboard with 2 PCIe slots in a mini tower that allows 2 full height PCIe slots would be fantastic. A good compromise would be a 2U design with 2 HHHL slots, with some room for fans much quieter than any 1U allows. Supermicro simply doesn't make such a system, at least not currently. While these 2 new arrivals are a step in the right direction, I just don't see that step as going nearly far enough to allow customers to enjoy the vast expansion that Xeon D-2100 systems could offers, if only it were in the right chassis. Imagine a system sold with the SYS- prefix as a just-add-storage System. A turn-key SuperServer solution for small businesses and home labs, where both noise and expansion capabilities are very real considerations. Given the higher return rates for 1U Xeon D-1500 systems to Wiredzone these past 3 years, I still have no regrets to focusing my attention on the much more versatile mini-tower form factor Bundles, with far greater family acceptance factor and bang-for-your-buck than all similarly priced 1U variants. That's all detailed at TinkerTry.com/compare. That said, of course I've been keeping my eye out for appealing alternatives all along, seen here for example. Realistically, I'll likely need to wait for Intel's long-awaited 10nm production finally gets going before I can possibly justify investing in new gear to keep, not just test. I'm still very happy with my SuperServer Workstation, and am using it for all article content creation and 4K video renders for about 2 years now. Xeon D-1500 has been the absolutely rock solid platform I've sought for a about 2 decades, with full VMware vSphere 6.7 support and a crazy-easy install. I'm also sure glad I invested in the full 128GB of RAM, back when each of the 4 32GB DDR4 modules were a mere $199 USD! If one or both of these new E300-9D systems make their way onto the VMware Compatibility Guide - vSAN ReadyNodes soon, that could be make things much more interesting during this long wait. Feel the need for an even deeper dive and analysis? I've published my observations on Xeon D-2100, along with detailed advantages and disadvantages, published right in the world's first look at the original SYS-E300-9D right here at TinkerTry. 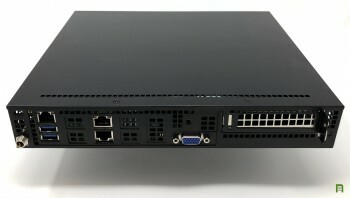 Supermicro SuperServer SYS-E300-9D-8CN8TP back. Note the HHHL Add On Card pictured at right is optional. William Lam now has his hands on one of these systems, with some pics he tweeted here, including mention of the (peculiar) use of mSATA. David Chung's SDDC in a box uses 4 Xeon D nodes for vSAN, is relatively quiet, and fits in carry-on!